I hit my limit and had a minor meltdown....poor Sam (he deserves a best hubs award). We're on day 37 of being in the hotel with no end in sight. Or maybe it was the 5 minute video chat with an old friend running around to get her kiddos ready to run out the door in an oh-so-familiar-house that I spent hours in during Sam's deployment. Or the video messages from my sister and her adorable triplets that I'm missing grow-up every second that goes by...or the fact that my mother is not feeling well and I can't be there to comfort her (pray for her and send good vibes, please). We're on week 5 of being stuck in this hotel room because our first request for getting off post housing was denied (15 days later). After Sam appealed the denial and spoke to various important people getting no real sympathy, we are on day 8 of the appeal. Maybe this one will come back on day 14, so we can go ahead and submit our third and final appeal. I'm tired of wearing the same clothing and want to burn them all give them to Goodwill. In case you were wondering, we're on week 8 of being in the same clothes because we decided to visit family and friends before our departure. Sorry you are seeing the same dress in the photos below for the 18th zillionth time. The contents of our whole house are sitting in a storage facility in Germany, and we can't have it because we're homeless. On the upside, when we do get a home we'll get our stuff quickly. I haven't done a DIY project in I don't even know how long, and that is quite possibly why I'm going crazy. I'm still awaiting to hear back from potential job opportunities and am working on writing up and submitting manuscripts from my fellowship. We're still working with Emma and her socialization. She growls at dogs on walks and turns into a zombie from The Walking Dead (We've been catching up and are on season 3 now, it's sooo good). I know it's because she doesn't want any dog trying to steal her amazing owners, but I'm not sure if the Germans understand her zombie talk. So, now we're on with attempt number 503 that will involve lots of nice talk and treats when she sees other dogs coming. Sam is not, and never was, optimistic. I'll keep you posted. We've met some pretty good friends and enjoyed celebrating my birthday...almost to 30, yikes! But today I was asked if I was here as a child or spouse, so that's a good thing, right? Meet our new city! Isn't the church beautiful? 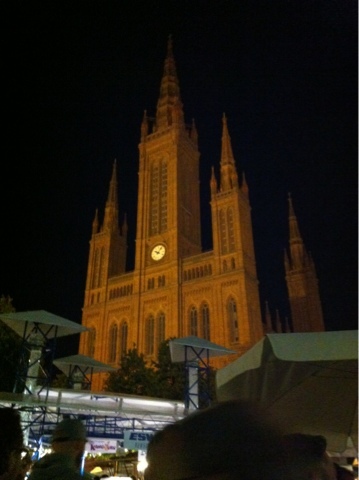 This is the Market Church and pictures don't even come close to showing its beauty. Every time I look at it I feel like it doesn't belong. Here it is at night. This is a beautiful park located downtown. This building is actually a casino. Apparently everyone gets super dressed up to gamble. Can't get much more perfect. 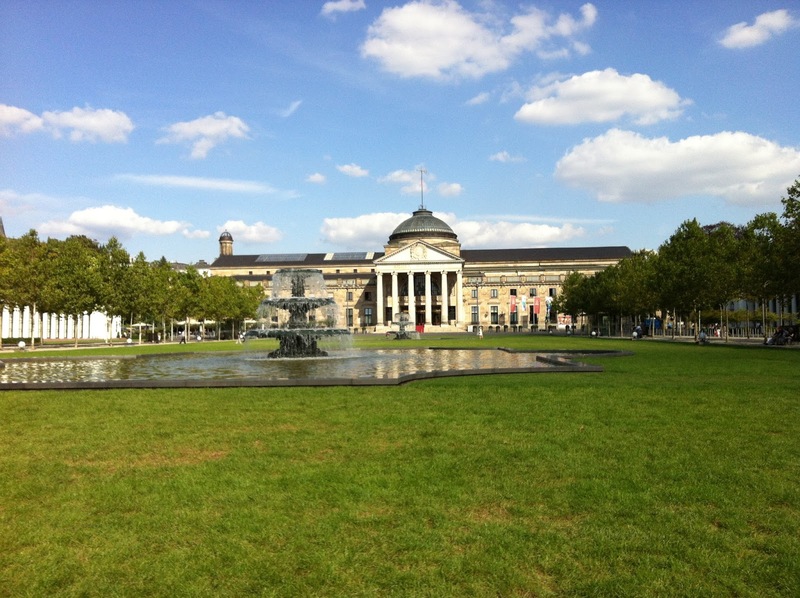 Wine fest in Wiesbaden started last week. 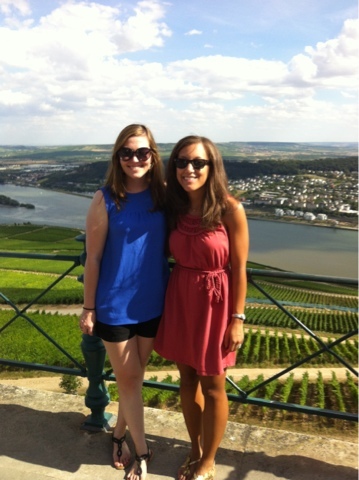 The Rhine is known for it's Riesling. 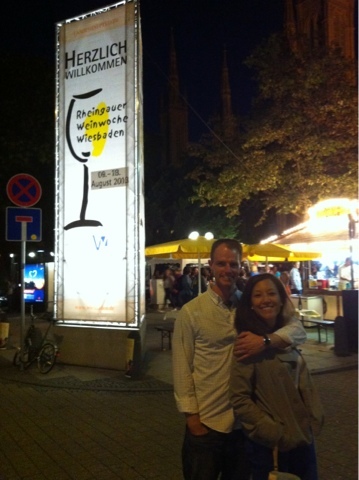 We probably tasted 30 plus types of Rieslings within the past week. Everyone sits around and drinks wine while eating lots of good food. Be on the look out for a post on all the good foods we've tried since we arrived. There's that church again. Do you see the Buckeye? He just finished the Iron Man....craziness! We went out to get drinks at the wine fest on my bday night. 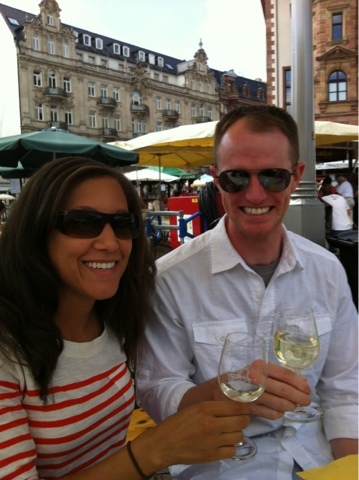 We also took a 30 minute train ride to Rudesheim for their wine fest. We went along with some new friends we made. 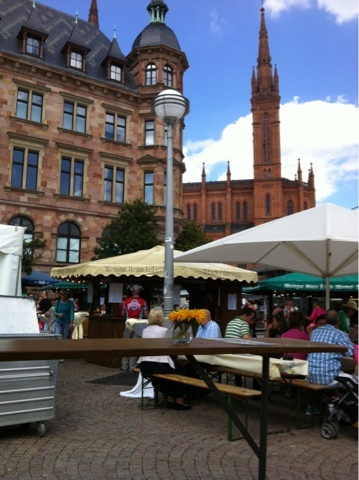 The Rudesheim wine fest was much smaller, but the city is along the Rhine river and surrounded by vineyards. They have a sky-lift that takes you over the vineyards and gives an excellent view of the river. Meet Germania. 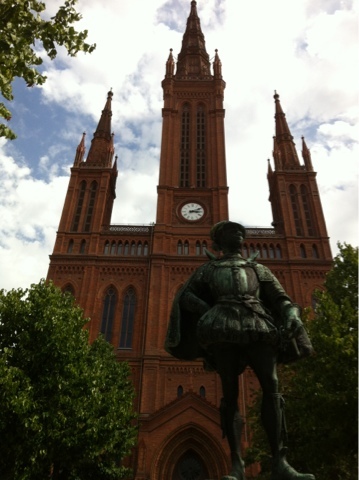 She was built after the Franco-Prussian war to unite all of Germany. My new friend, who is also from GA! Anybody know her? The only problem is she made the mistake decided to go to Auburn instead of Georgia. We're still figuring out how this friendship will work. Next we took about a mile hike through the woods where we did a little bit of UGA - Auburn trash talk while looking for wild life. Then we took a lift down the other side of the mountain. 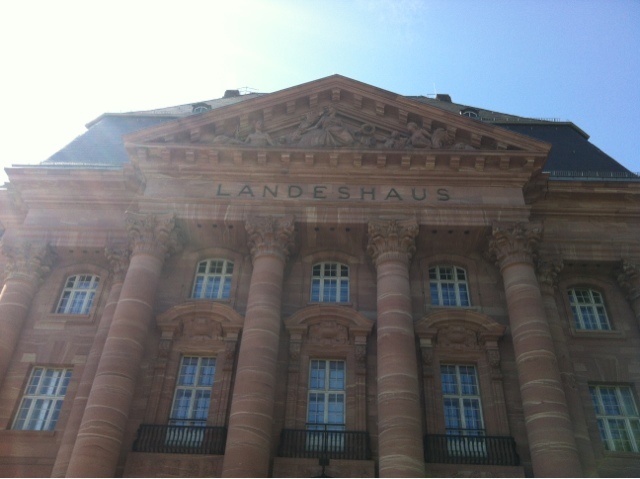 The final part of the tour was a boat ride on the Rhine. This is mouse tower. So tiny! The guys doing some window shopping on the busiest, tiniest street in Germany. Here's a video of us finishing the day at a German restaurant. Enjoy! Oh Michelle! I feel so touched by your words... I can see us in them. You made me remember when we came here, no home, no family, no friends...it felt devastating some times. But please, know that things change with time and they get a waaaaaaaayyy better. 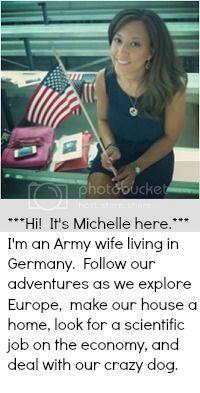 I hope you guys find your own space soon, and you become friends with this girl from GA (please, if you're reading that, you should know that Michelle is super awesome!). And about your clothes... who cares! hahaha this reddish dress and your gold color sandals make you look like a greek goddess (I would wear them every day if they made me look like you do!). Lots of hugs and lots of kisses. And skype me if moral support is needed!! (I miss you! ).